The previous iteration of the Rab Latok Ultra bivi, this eVENT mountaineering shelter purports 4 season comfort as a single wall, ~3 lb. “two person” tent. Er bivi. Bivvy. Bivy? Before UK mountaineering manufacturer Rab introduced the Latok Ultra bivi in 2012, this single wall eVent shelter was known as the Summit Superlite Bivi, and at a weight penalty of merely 3 lbs. ± 3 oz. (depending upon configuration) was & is among the lightest mountaineering shelters available on the market. eVENT waterproof/breathable fabric, specifically 3.1oz triple grid 15d ripstop waterproof breathable nylon with a tricot backing, doesn’t technically comply with accepted US standards for flame retardation, and as such GE – owner (via purchase) of the eVENT membrane technology – hasn’t approved release of any shelter that conforms to standardized “tent specifications.” As a result, the Rab Summit Superlite Bivi – and its updated doppelgänger the Rab Latok Ultra – redline the tent spec with a shelter that’s almost tall enough, nearly long enough for a 6′ human to live in comfortably. Almost. The Summit Superlite and its direct descendant are in fact a bit of overkill for simple, winter camping: it is correctly a single wall mountaineering shelter, per the manufacturer suited for “expedition / self assisted polar and high altitude / summit assault” capable of withstanding extreme weather and wind conditions, with myriad guy points, an apex belay donut, dual crossover pole configuration, and a tunnel vent for belay tie-in and snow collection. The result isn’t a four season ‘tent’, but a “fourth season” shelter I would only use on snow and in inclement winter/polar/mountaineering conditions. That said, on several trips in the Pacific Northwest Gorge & Cascades this season, for a mere 3 lbs. carried I’ve appreciated the nuanced creature comforts that a full shelter provide – chiefly freedom of movement and the ability to keep all of my gear directly out of the snow – that I’ve had to forgo in my previous winter kit comprised of an OR Alpine Bivy + SMD Gatewood Cape. The lone issue I have with this shelter lay in the cramped quarters provided. Between the “bivi” spec constraints and the trade-offs necessary to keep the weight down near 3 lbs., the dimensions are a bit Spartan for anyone 6′ tall or taller. I’m roughly 6’1″ and while I’m able – barely – to sit up fully atop an inflatable pad such as the NeoAir All Season pad if leaning a bit forward, it’s only marginally possible for me to lay comfortably stretched out head to toe without angling my pad diagonally across the Superlite floor. Despite the tight quarters I’ve been able to sleep quite comfortably in this diagonal fashion: the primary need to do so isn’t so much that I couldn’t stretch out my legs, which I could and don’t particularly need to as a side-sleeper; rather, it’s to keep one’s face from bumping up against the relatively steep end walls that practically ensure that anyone over 6′ in height sleeping at right angles to the door may awake find their nose out the rear tunnel vent. 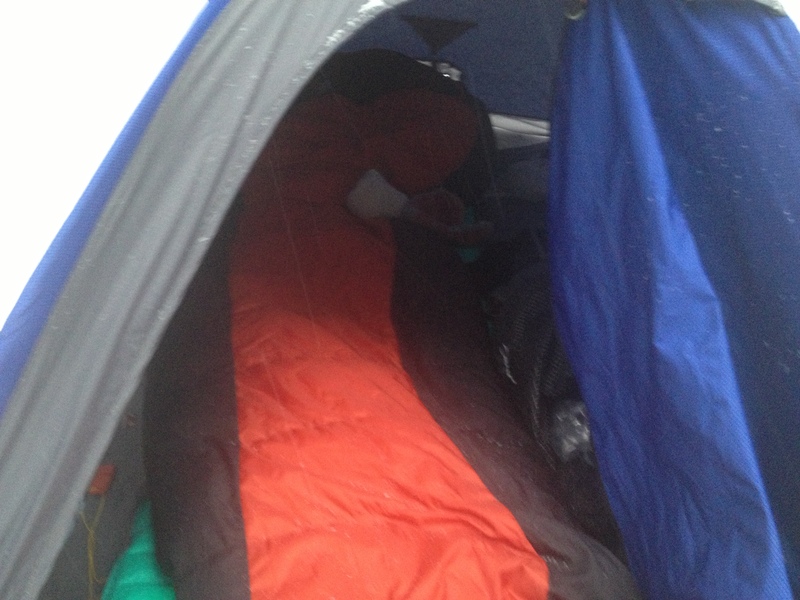 With a height of 70cm (27.56 inches) it does as I noted previously provide just barely enough head room to sit up, kinda, atop an inflatable pad without hitting the crown, but it’s considerably shorter than the ~40 inches of peak height found in many 3 & 4 season tents. 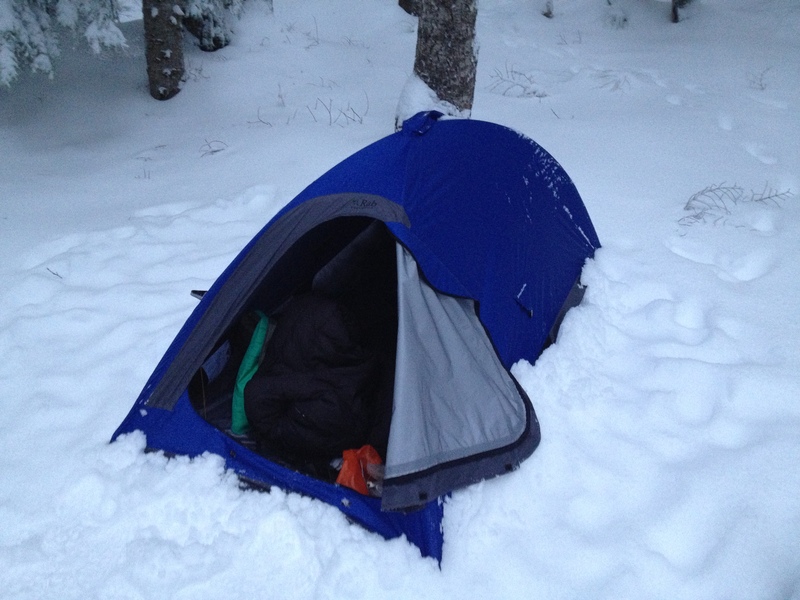 In my experience however this is important mostly in a 2 person tent when conditions may force you and a companion to spend extended hours in shelter, and for solo use I’ve been able to dress, eat, treat water – even employ indoor plumbing – without much fuss, and for me the peak height was a minor issue. The Rab Summit Superlite Bivi is incredibly easy to setup, utilizing 2 fairly standard shockcord/8.84 mm (0.35″) aluminum poles in a crossover configuration, with Velcro loops to keep poles in place in the interior, and four very tough pole pockets in the corners. This is key because you’ll put a lot of torque on those corners as you slide the poles into place. I’ve found the easiest way to set the Superlite up is to do so standing, with the bivi rear above you: do one pole corner to cross corner first, slide into correct position and secure with the Velcro tabs, and then repeat with the second pole. With this method I’ve been able to get the Superlite into freestanding position, ready to stake/guy out in less than five minutes, wearing gloves. Takedown tip: undo the Velcro tabs first thing on your last morning when you’re warm and you can do so without gloves or mitts – it won’t affect the setup integrity unduly and it will be immeasurably easier to get the poles out w/o having to get back into the bivi. The Rab Summit Superlite Bivi, now essentially known as the more predictably colored and more interestingly named Latok Ultra Bivi, is an excellent ultralight single wall minimalist mountaineering shelter worthy of winter adventures above and below the timberline. It’s not ideally suited for two people, taller folks, or claustrophobic types, but it remains a unique UL solo shelter for those seeking summit-worthy protection in a ~3 lb. package. Gallery | This entry was posted in Gear Reviews. Bookmark the permalink.